Turning 17 is a special milestone. 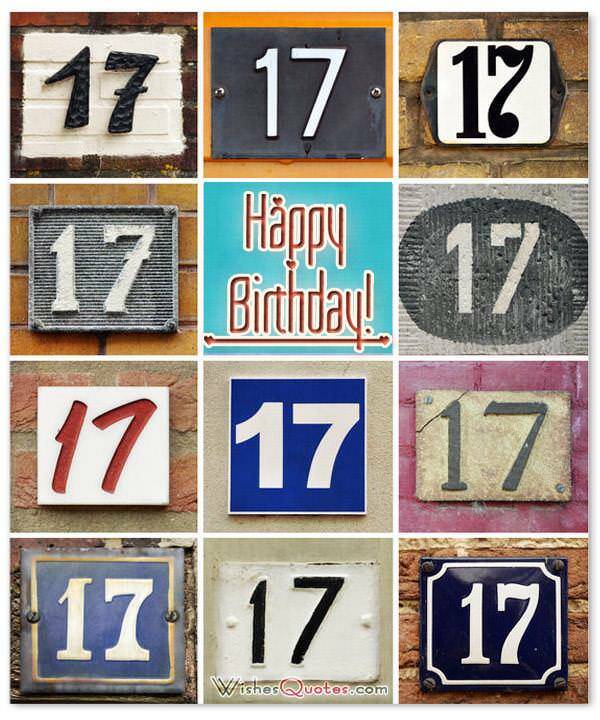 In regions where 18 years old marks the age of legal adulthood, 17 marks the final year of childhood, in many ways. 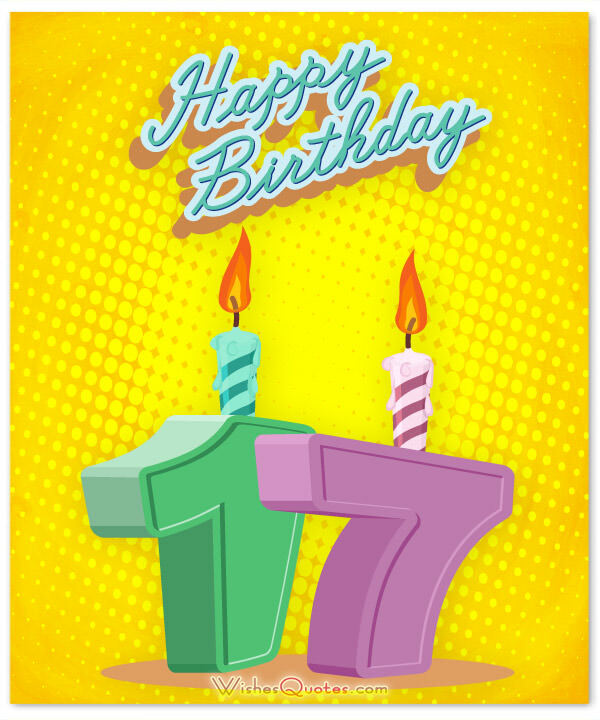 The 17th birthday should be celebrated as the special time it is, with a lot of joy and laughter. You can help the birthday boy or girl have an extra-wonderful day by sending a caring message in a card, in a text or online. 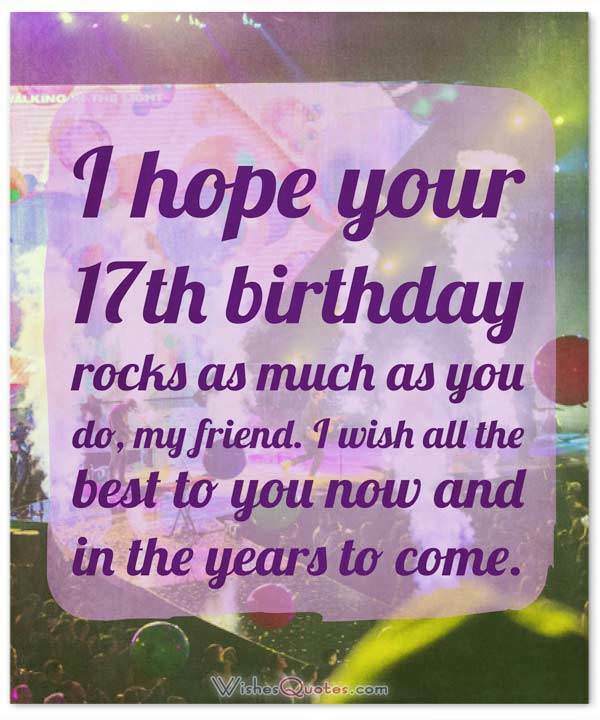 Here are selected 17th birthday wishes for a friend, a son, daughter, brother, sister, girlfriend or boyfriend who is celebrating their 17th year. Feel free to use any of these examples and customize a message to match your feelings towards your loved one. I hope your 17th birthday rocks as much as you do, my friend. I wish all the best to you now and in the years to come. I may not have known you for the full 17 years of your existence, but the very few that you have been by my side, make me understand that you were equally amazing on the rest of them. Happy birthday! This day celebrates 17 years of your awesomeness. Happy Birthday to the coolest friend I have ever known! Rock on with your awesome self! If this day was an object, it would be a door, leading you to new adventures, new challenges, that you now have to face being one year older. Happy birthday! It is hard to believe you will be 17 already. I am glad we are friends and I hope your day is amazing! It seems only yesterday we were starting High School! We have had some amazing times and I am so glad I get to see you on your birthday! As you steadily evolve from a child to an adult, I want you to always remember the good qualities you have had over the past 16 years. Never forget who you are, because the person you are right now, is truly amazing. Happy Birthday! 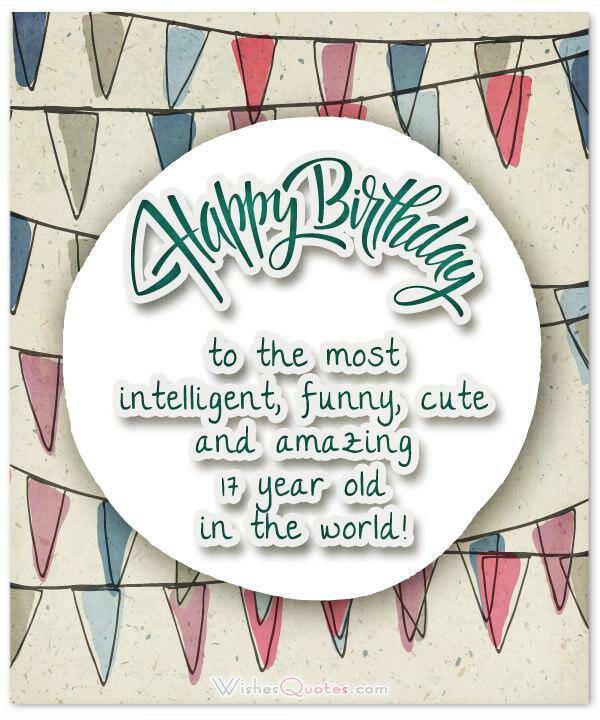 Happy Birthday to the most intelligent, funny, cute and amazing 17 year old in the world! I hope we are always friends! I’ve watched with pride as you’ve grown from a boy to a man. Happy 17th birthday to my amazing son. It is an honor to be your dad. A lot has changed since I was your age, but I remember that 17 was a special time. As you move from childhood to adulthood, know that I am so glad to have you as my son. From seeing you in your diapers playing around with your toys, to being one step away from becoming an adult. It really makes me proud to have seen you grow so much. Happy birthday! Through the years, I’ve watched you grow, and now I stand amazed at the young man before me. Happy big 17th Birthday to my wonderful son! Happy Birthday to the best son on earth! Seventeen is an amazing age. This year I hope you have tons of fun but that you stay safe and happy! I can’t believe my little boy is now all grown up! Happy 17th Birthday to my handsome, awesome son! You have always been special and you are growing into an amazing woman now. Happy birthday to my wonderful daughter! For every year you have lived, I have loved you twice as much as the last one. That means, that starting today, I love you 131072 times more than the day you were born! I’d like to see you live long enough for me to go over 1 billion! Happy birthday! The years seem to have flown by. It is hard to believe that the little girl who begged for a bicycle is now a 17 year old with her own car. I hope you know how happy I am to call you my daughter. Always remember that you are an amazing person! Happy 17th Birthday! Happy birthday to my beautiful daughter! I look so forward to all the good things you will do in the future! From watching you play with toy ponies to seeing you land your first job, I’ve watched you grow but it is still hard to believe you are 17. Happy Birthday! I pulled your hair and took your toys and yet you always remained patient with me. Thanks for being the best sister. Happy 17th! Sisters are like extra special friends who share so much. I am glad you are mine. Happy 17th birthday! You are turning 17 and as your bratty older brother I will say, you turned out pretty good for a girl. Happy Special Day! We didn’t always get along, but I was always proud you were my sister. Happy 17th, from your favorite sibling. You taught me a lot and I will always be grateful to have you as an older sister. I hope your birthday is all you dream it could be! You picked on me but I always knew you were there for me. Now you are turning 17 and growing up. I just want you to know I am happy you are my brother. As far as brothers go, you are at the top of the list. Happy Birthday to the coolest dude in the family! I have a confession. Even when I was teasing you, I always admired you. Happy 17th Birthday to the best little brother a guy could have. Now that you are turning 17, I hope you will still play basketball with me and let me borrow your stuff. Even if not, I still wish you a very Happy Birthday! One thing great about a brother like you is I always knew I could count on you. Thank you for always having my back. Happy 17th! Seventeen candles are going to brighten up the room, but not nearly as much as your beautiful smile. Happy birthday to the best girlfriend I could imagine. To my best girlfriend ever, I hope your birthday is as wonderful and as beautiful as you are! I am so happy we are together! 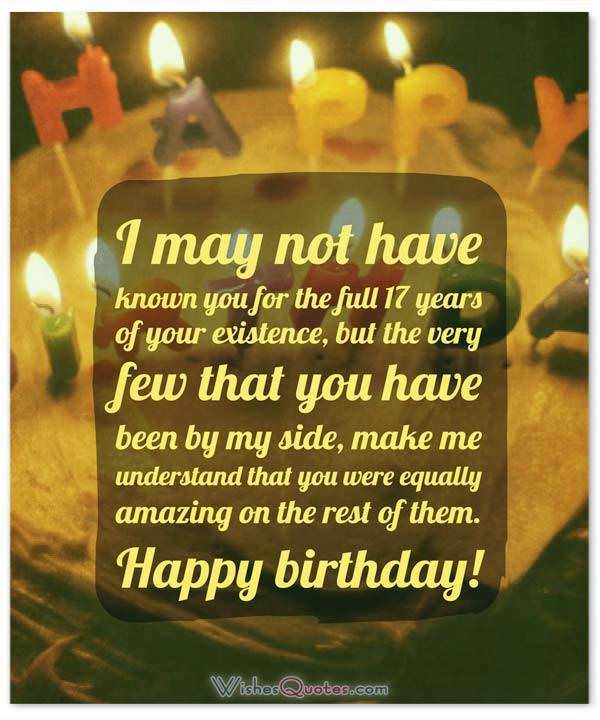 For my special girl, may your 17th birthday be filled with magic, happiness and all that you wish for. I knew you were special the moment I saw you. Now, as you turn 17, you are even more beautiful than before! I cherish the day you were born, because it means I got to meet you and call you my girl. Hope you have an extra special birthday this year! Of all the guys in the world, I am glad you are mine. Seventeen is a very special birthday. I hope it is all you could wish for and much more! You are charming, kind and a gentleman with a personality way beyond your years. Happy 17th to my boyfriend. I cherish you! On your birthday, I want to share with you how much you mean to me. It isn’t just your cute smile or the things you do, but also your loving spirit. Just because you are turning 17 doesn’t mean you have to grow up! I hope you always keep some of your playful humor that I love so much! I am so proud to be your girlfriend. I hope your birthday is amazing and memorable in the best of ways!